You are here: Home / Blog / How Often Should Commercial and Residential Carpets Be Cleaned? How Often Should Commercial and Residential Carpets Be Cleaned? All homeowners are aware of the need to maintain and improve indoor air quality in their homes. And one of the most important steps they need to take to improve home hygiene is to have their carpets cleaned and sanitised on a regular basis. We all know of the multitude of organisms and toxic particles that nestle in peace in the lush pile of our carpets. The microbes that thrive on carpets off-gas harmful mycotoxins into the indoor air. Pet dander, millions of dead skin cells that we shed every day, dust mites that feed and thrive on the accumulating skin cells, air-borne pollen and chemicals, fungi, carpet beetles, ticks and fleas are some of the things that a carpet cleaner flushes out from a carpet. If you consider an office environment, the carpets obviously are much dirtier with heavy footfall. 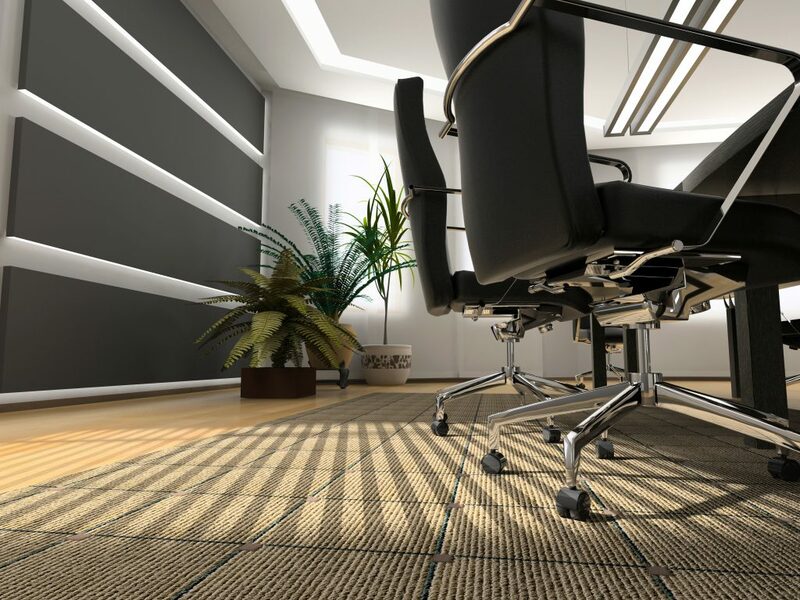 Office carpets also filter a wide variety of things like dust, chemicals from commercial office cleaners and other office equipment, food particles, smoke and all that the employees track in daily from outside. Cleaning office carpets ensure good indoor air quality! Now that you know carpet cleaning is essential, the other question that pops up in your mind is obviously how often should you have your office and home carpets cleaned? The frequency with which you need to clean your carpets depends a great deal on what they are subjected to. Carpets enjoy a peaceful and uneventful life in a single member household or a home with a retired couple, requiring cleanings as infrequent as every two years or so. The case is reversed in a full house with pets and children, and in the case of commercial carpets. The damage caused is so severe that in many cases the carpets require quarterly cleaning. Let’s see how usage affects carpets. They are the biggest causes of damage to carpets. They track in dirt all day, bring friends over, play, eat, sleep and roll around on carpets. If you have toddlers or young children at home, you know that their grubby and grimy fingers are all over your couch, cushions and inevitably on the carpets as well. Food, sauces and juices are the biggest causes of carpet staining in households with babies and small kids. And any mom with small children knows that ‘accidents’ are unavoidable. Urine odour is among the hardest to remove and often seeps deep into the backing before you can reach for the blotter. The carpets are soiled, dirty and cry out for a hot rinse in no time. Professional carpet cleaning is recommended every four to six months in order to ensure a healthy and hygienic environment in homes with kids. Strappy teenagers also cause as much damage as children, especially in areas where they lounge around the most. When you call in professional cleaners inform them beforehand if you have teens or toddlers at home. The cleaners will be well-prepared for the deep-seated grime and stubborn stains that welcome them in teen bedrooms, and toddler play areas. With teens in your home their friends are obviously over most of the time. We are sure regular vacuuming and yearly cleaning will not please a finicky mom. We recommend you have your carpets cleaned every 9 months for best results and a hygienic home. Who does not love the company of a faithful dog or a cute cat? Pets have a relaxing and rejuvenating effect on their owners, and make it a pleasure to come back home after a long and tiring day. But the effect they have on carpets is quite the opposite. Dogs love to run around outdoors and there is not much you can do to prevent them from running in after that. Their paws track in dirt and mud from outside which gets deposited on the carpets and soils them. Pet dander makes up a large portion of carpet soils and is one of the chief household allergens. Dogs and cats, as you may have noticed, often have favourite spots on carpets where they love to rest. Over a period of time, the body oils they rub onto the carpets result in a darkened and dingy look around their resting spots. Only a professional cleaning can help you get rid of that. Poop and urine accidents also cause much damage to carpets and make frequent cleanings a must. Regular vacuuming can help reduce the frequency of cleanings but getting your carpets deep cleaned every 6-12 months is recommended by experts. Extend the longevity of clean carpets with our service. The above carpet polluters are mainly restricted to homes; offices see many more vicious carpet soiling agents. An office carpet sees a very high level of traffic, due to employees, visitors and others coming in for various work. There is a constant flow of people which soils the carpets quickly and also forms marked traffic lines. The carpets need to be vacuumed daily after office hours to remove the accumulated dust and dirt. In addition to this the carpets also filter air-borne smoke and allergens. Dust that comes in from construction activity going on in the vicinity, or from heavy traffic on the roads outside also homes in on the carpets in your office. In addition to this, office air also contains toxic chemicals emitted from cleaners and other office-use machines and equipment. Sick employees cause germs to deposit and thrive on carpets. Food droppings, stains and spills are also common. Commercial and office carpets need to be cleaned at least twice a year, if not more often. Each office has its own unique needs, so tailor your cleanings accordingly. All homes and offices have their own special sets of needs. Scheduling professional cleanings as per your requirements helps maximise the benefits you derive from them. Or you can call us and we can work out a yearly schedule as per your needs and convenience.